What do you do for your wedding gift list if you don’t need more stuff for your home? Perhaps you’ve been with your partner for a while, and you’ve already stocked out your kitchen with all the dishes and appliances you need? Or perhaps you’re combining two independent households, and each of you already have bed sheets and wine glasses? Perhaps what you’d really love, is to be able to start your married life together with the holiday of a lifetime. Wouldn’t it be great if your friends and family could contribute towards your honeymoon, but in a way that felt more like a traditional gift registry than just an anonymous pot of cash? Well, Buy Our Honeymoon is an alternative gift list service that allows couples to create their own fantasy wish list of experiences, activities and contributions to make your honeymoon the trip of a lifetime. You can include anything you can think of — from jet skiing in Barbados, to backpacking supplies for the Inca trail. So basically it works by you signing up for a free, no-obligation 7-day trial. A free trial is always good so you can have a play around, see how it works before you pay for it! You can select from a variety of web addresses for your guests to visit, such as ourdreamhoneymoon.com or honeymoon-memories.co.uk. Then start customising! 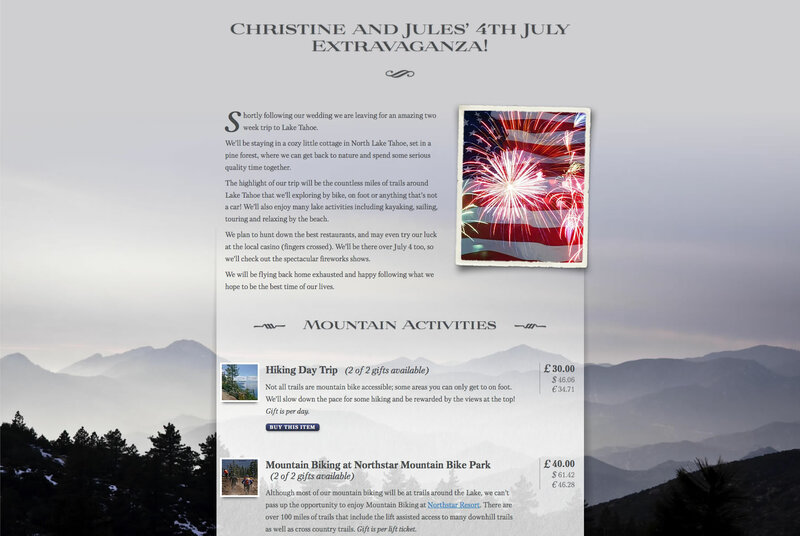 You have the option of customising the introductory page. This is the page your guests will see when they first visit your list. It’s useful to explain here how the list works and to briefly mention how you’d like your guests to pay for the gifts they reserve. They’ll then click a button to view the list itself. If you’re an organised individual like myself, you are likely to have an idea of what you want to do on your honeymoon. So on the List Preamble section ist the text at the top of your list page. It’s purpose is to put in the list by context by describing your honeymoon itinerary. Points such as where you are going, how long you will be there etc. “Immediately following our wedding at Westminster Abbey we are leaving for a glorious six-month circumnavigation of the globe. Our travels begin in Lapland where we hope to experience life as an Elf. We will be staying at the Santa Claus Hotel, made famous in several movies. After a few days of pampering, we are bound for Greenland to see the Northern Lights. Apparently the fly fishing is amazing this time of year. After a relaxing two days, we are going to Uluru in central Australia. They say a famous Aussie cartoonist lives there, so we should be able to bag loads of great artwork. Easy peasy – set up your preferred payments.The site offers a free 7-day trial, and takes zero commission from the gifts you receive. The value of your gifts is always paid directly to you, in whatever way suits you best. So there are three main options. If you and the majority of your guests are based in the UK, the best way is to take advantage of our unique Direct Debit payments option. Your guests only need to enter a few details into a secure on-screen form — it’s as easy and safe as paying with a credit or debit card, and the funds are automatically deposited straight into your own bank account. Alternatively, you can link your gift list to a PayPal account, so guests are able to easily and conveniently pay online using a credit or debit card. Some couples choose instead to receive cash or cheques on the day of their wedding, and others leave details on making a balance transfer to their bank account. It’s completely up to you. Either way, at the end you are able to customise your instructions to your guest and a message to thank them. This is important because if you have a standard thank you message, it doesn’t come across as grateful. If you personalise it in yours and your partners tone, your personalities will shine through and your guest will be able to imagine how pleased you are! 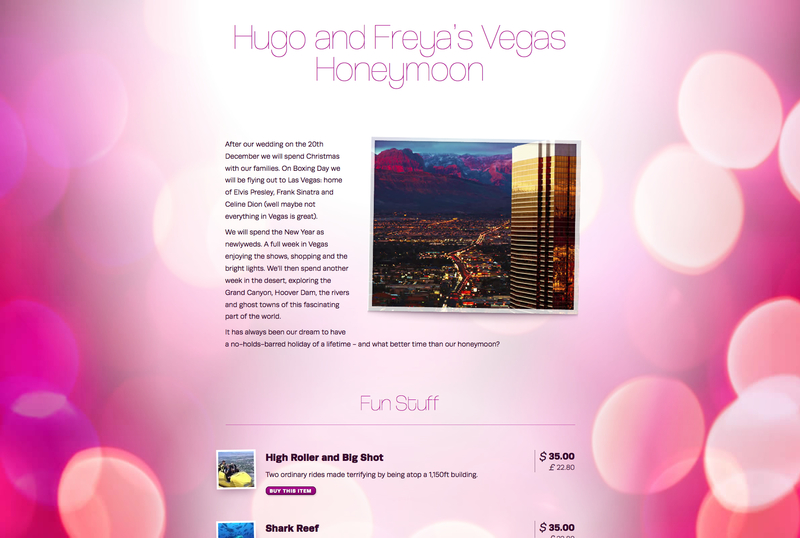 Fabulous – now the fun bit, what to do on your honeymoon! Think about each option from the available list items and how it can fit into your plans. For instance, don’t apply for a scuba dive if your partner isn’t keen on water! Common sense, right? I know, but it can be tempting to think “Ooh I want this, or that”. Make a list between you and your partner and then agree on what works and you both seem happy with. A great thing about Buy our Honeymoon is that you are not limited to X amount of items on your list. You can include as many different items as you like, in any number of categories, and even mix honeymoon gifts with traditional household items. Who is behind Buy Our Honeymoon? 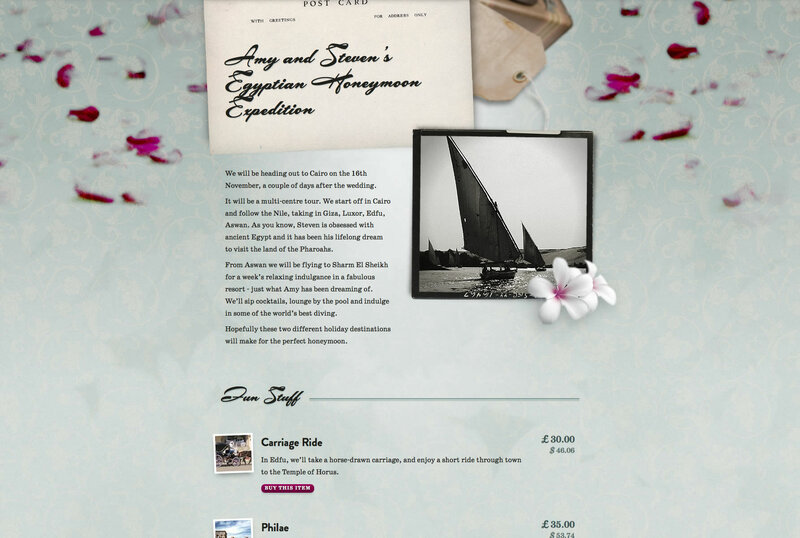 Buy Our Honeymoon was created by Shelley and Andrew Green for their own wedding in 2005, and was met with such an enthusiastic response from their guests that they were convinced to launch the site nationwide. Their dream honeymoon road trip around the Deep South of the USA is one of the example lists. You can try out all their unique features by signing up for a free 7-day trial, with absolutely no obligation. If you decide to go ahead, they have a simple, honest one-off fee of £55 (or $64 outside the UK). 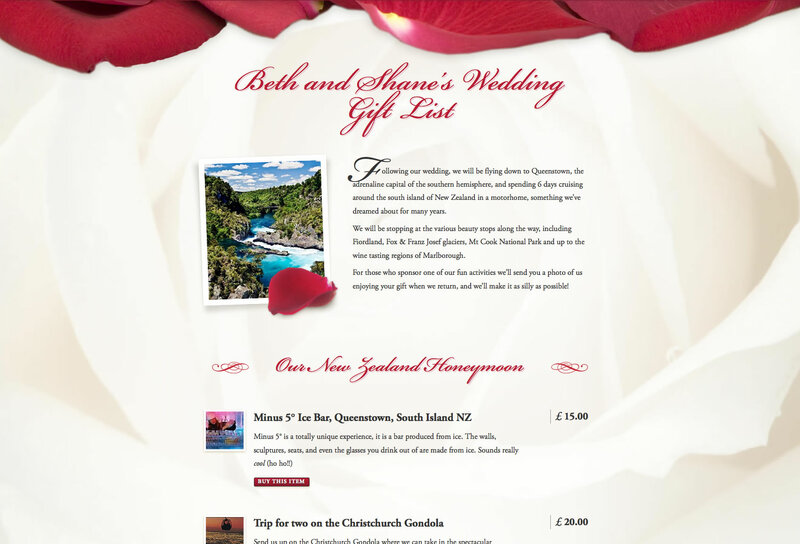 For more information on how to make the most of your honeymoon gift list, visit Buy Our Honeymoon at www.buy-our-honeymoon.com/ or call 0845 224 0189.